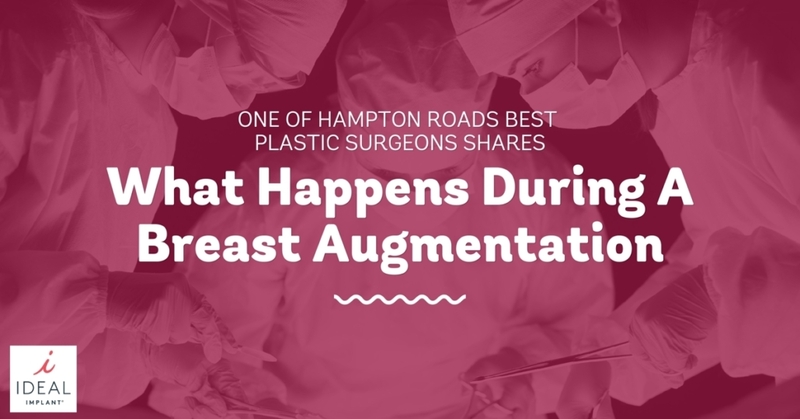 Have you ever wondered what happens during a breast augmentation surgery? Patients are under anesthesia during the surgery and unaware of what is being done. Surgeons sometimes do not explain the step by step process of the surgery to their patients. Now Dr. Matthew Galumbeck, a board-certified plastic surgeon in Virginia Beach, shares what really goes on when the patient is asleep. Dr. Galumbeck uses the IDEAL IMPLANT® Structured Breast Implant to give his patients beautiful, natural looking results without worrying about silent ruptures. Learn about a real surgery performed by Dr. Galumbeck as he informs us of the process below. Before you can even consider what surgery will entail you need to find a plastic surgeon. Start by searching for a plastic surgeon who is board-certified by the American Board of Plastic Surgery. A board-certified surgeon receives training specific to plastic surgery, and stays up to date with medical research. Schedule a consultation so you can get to know your surgeon and feel comfortable with them. Look at before and after pictures of previous surgeries, either at the surgeon’s office or on their website, to judge their skill level. Find out how many breast augmentations they have performed, and look at patient reviews on websites such as RealSelf. Dr. Galumbeck’s patients often call him one of Hampton Roads best plastic surgeons because he is experienced, skilled, and compassionate. Learn more about Dr. Galumbeck’s education and experience by visiting his website. Dr. Galumbeck will assess your size, learn about your desired results, and make recommendations for an individualized treatment plan. Your breast augmentation can be combined with other procedures such as a breast lift or a tummy tuck in order to achieve your goals. While at his office, you will be able to view before and after pictures from real patients on whom Dr. Galumbeck has operated. Dr. Galumbeck is dedicated to listening to his patients and providing them the best options for a safe and effective plastic surgery experience. Before your breast augmentation, your surgeon will help you choose a type of incision. Your incision site will determine where your breast augmentation scar will be. There are benefits and compromises to each type of incision and your surgeon can explain these in detail. The incision itself will be a few centimeters long if you choose an IDEAL IMPLANT Structured Breast Implant, or longer if you choose a silicone gel breast implant. This is because silicone gel breast implants are pre-filled with silicone gel, while the IDEAL IMPLANT comes as a shell that can be rolled up, inserted, and then filled with saline once it is placed in the breast pocket. Below is a basic description of each type of incision. Axillary Incision: An incision through the armpit, made so there is no scar on the breast. However, if a sleeveless top or swimsuit is worn the scar can be seen when the patient lifts her arms. An endoscope is used to create and check the pocket. Inframammary Incision: This incision is performed under the breast, in the breast crease. The scar can be hidden under clothing and swimsuits, but may be visible when lying flat. Transumbilical Incision: The implant is placed through an incision in the belly-button. This type of incision is uncommon because it is not recommended by breast implant manufacturers and many surgeons do not use it. Similar to an axillary incision, an endoscope is used to create and check the pocket. Picking your breast implants is one of the most important decisions you will make. Each implant type has unique benefits and compromises to consider. Silicone gel breast implants used to be a popular choice because they offer a natural looking result. However, they come with a risk of silent rupture, which is a rupture that may show no symptoms for years. The FDA recommends that women with silicone gel breast implants get an MRI every three years to check for a silent rupture. A ruptured silicone gel breast implant must be removed, along with any silicone gel that has leaked into the breast tissue. Many women feel anxiety about not knowing the status of their implant. This, combined with the cost of repeated MRIs, caused many women to desire an alternative to silicone gel. The IDEAL IMPLANT Structured Breast Implant was created to give women the beautiful results they want, without worrying about silent rupture. It was FDA approved in 2014. The IDEAL IMPLANT is a structured implant with multiple layered shells. These shells give the implant stability that results in a smooth, natural looking breast augmentation. Dr. Galumbeck is one of the only surgeons in the Virginia Beach and Hampton Roads area to offer the IDEAL IMPLANT Structured Breast Implant. He is also one of the top surgeons in the nation using this implant and was recently named an IDEAL IMPLANT Premier Surgeon. Breast implant choices are important for women to have. It is up to you to decide the best breast implants for your body and your lifestyle. You can get more facts about how breast implants compare by visiting the IDEAL IMPLANT comparison page. Another choice your surgeon will discuss is whether to place the implant under the pectoral muscle or on top of it. When the implant is placed under the muscle it is less likely to ripple, has a lower risk of capsular contracture, and is easier to read on a mammogram. However, implants placed under the muscle can also become displaced upward when the muscle is flexed. Implants placed above the muscle tend to have a rounder shape and are not distorted when the muscle is flexed. This type of implant placement may also prevent the need for a breast lift in some women. However, placing the implant above the muscle does have a higher incidence of capsular contracture and implant rippling. For patients choosing to place their implant above the muscle, the IDEAL IMPLANT Structured Breast Implant is recommended because the structure makes it less likely to ripple and it has a low risk of capsular contracture. Dr. Galumbeck strives to provide his patients with the most effective treatments performed in a private and comfortable environment. He performs breast augmentations in his fully accredited operating suite. The first step before your surgery is to make preoperative markings, to ensure your breast implants are placed properly. A physician anesthesiologist will then administer IV anesthesia. After you are asleep, Dr. Galumbeck will use the incision you have chosen to begin your breast augmentation. After checking the pocket Dr. Galumbeck uses a method to reduce risk of infections, “We’re going to get an antibiotic soaked gauze. I’m going to put that in to make sure that we don’t have any worries of infection.” Dr. Galumbeck uses an endoscope to check inside the pocket and make sure everything looks ready to place the breast implant. An endoscope is a small camera surgeons use to look inside the body. Dr. Galumbeck uses it during breast augmentations to check the breast pockets. When Dr. Galumbeck sees the pocket is dry, the surgery can move forward and he knows drains will not be necessary afterward. Using technology such as the endoscope and paying close attention to each detail is part of what makes Dr. Galumbeck one of the best plastic surgeons in Hampton Roads. Dr. Galumbeck inserts the IDEAL IMPLANT Structured Breast Implant by following a few simple steps. First the implant is soaked in an antibiotic to decrease risk of infection. After soaking, excess air is taken out of the implant and it can be placed through the incision. Dr. Galumbeck tells us, “the nice thing with the IDEAL IMPLANT is we fill it after the implant is in so it’s easier to make a smaller incision. Silicone gel implants, because they’re prefilled, you need to make a larger incision.” The IDEAL IMPLANT Structured Breast Implant is rolled up to make it small enough to fit through the incision. Once inside it is filled with saline and Dr. Galumbeck points out, “we actually have the ability to adjust to different fill sizes, if we need to adjust for symmetry we certainly can.” There are two fill ports and two fill tubes that surgeons use to fill the implant with saline after they are inserted into the breast pocket. After the breast implants are inserted and filled Dr. Galumbeck sits the patient up to make sure no adjustments are needed. When he is happy with the results, the fill tubes are taken out. Closing the incision is a delicate and artistic process which the best plastic surgeons in Hampton Roads take very seriously. Dr. Galumbeck uses a nylon suture that will be taken out at one week post-op. Dr. Galumbeck tells us this suture “won’t leave any stitch marks, it just slides right out in a week.” After this final step, each patient is taken to a recovery area for monitoring. Patients are typically sent home the same day, and can go back to work and social activities within a week. Remember to follow any post-op instructions given by your plastic surgeon, such as wearing a support bra or taking antibiotics. These instructions will help you to achieve your desired results and avoid excessive pain and infections. Congratulations, your breast augmentation is complete! If you chose the IDEAL IMPLANT Structured Breast Implant for your augmentation, there is nothing left but to get out there and enjoy your new body. With a rupture rate of only 2.1% for primary augmentations at 8 years, according to FDA trial study results, the IDEAL IMPLANT offers beautiful results with low risk of future complications. And if the implant does rupture patients know immediately because the implant deflates slightly. There is no risk of silent rupture and no need for MRIs, giving women peace of mind. Women with silicone gel breast implants should schedule periodic MRIs to check for silent ruptures, and visit their surgeon if they feel any symptoms such as tightening, tingling, or hard lumps in their breasts as those can be signs of complications. You deserve to feel confident and empowered in your new body. Visiting one of Hampton Roads best plastic surgeons, Dr. Galumbeck, is the first step in your journey. If you have ever considered breast augmentation, there has never been a better time to start. Considering breast implants in Virginia Beach? Contact Dr. Matthew Galumbeck today to discuss your options. Simply call 757-320-4115, or visit www.galumbeckplasticsurgery.com. Dr. Galumbeck’s office is located at 1817 Republic Road, Virginia Beach, Virginia 23454. Call today for more information on IDEAL IMPLANT® Structured Breast Implants.